Philips Sonicare has continued to amass a considerable reputation over the years. Their electric toothbrushes have been applauded for their form and function, catapulting them to be one of the most popular brands around. With the Philips Sonicare HealthyWhite+ has decided to add a rather specific component to their toothbrush – teeth whitening. While it offers basic dental care, the HealthyWhite+ model has gone one step further. 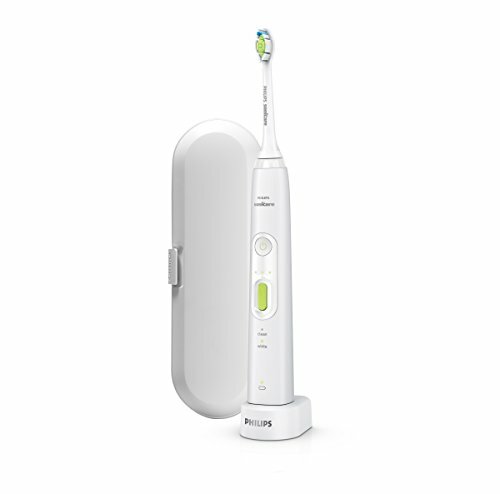 The HealthyWhite+ box arrives with the Philips Sonicare HealthyWhite+ rechargeable handle. It is also accompanied by one DiamondClean toothbrush head. Then, of course there is the small charger as well. Unlike many of the other electric toothbrushes, this model opts for a small and unobtrusive charging station. One of the advantages of this toothbrush is that it has been designed for travel. This is why you are given a hard travel case which allows you to safely and securely carry the toothbrush wherever you go. You also get a hygienic travel cap that can fit over the brush head to ensure that it is not exposed to any germs or bacteria. This is quite a basic package and there is not much else in the way of accessories or even extra brush heads. This model looks much like all of the other Philips Sonicare models, with nothing to make it stand out in particular. However, it is slim, lightweight, and ergonomic in design. As such, it is quite comfortable to hold and use. This particular model is available in white. There are two buttons present on the handle. The first is the power button. The longer button below it is used to select the different settings that are available with this model. The green offers a pleasant pop of color in an otherwise stark handle. Finally, there is the brush head itself that is labelled as DiamondClean. It is constituted of brightly colored bristles. The reason that this brush head has got its name is due to the fact that the bristles are in the shape of a diamond. This is not merely for aesthetic appeal, however. This is a specialized brush head that plays a large role in the whitening action of the toothbrush. The bristles are medium-stiff in strength and work to gently brush away plaque or stains from the teeth. The fact that it is more or less in the shape of a non-electric toothbrush is quite comforting. It feels less strange as you are brushing your teeth. Also, the shape and designs allows better access to the more difficult areas of your mouth. The HealthyWhite+ model has two modes – Clean mode and White mode. With the Clean mode, you are treated to a typical two minute brushing. During this mode, plaque removal takes place. This is actually done quite effectively. It is largely due to the sonic action of the toothbrush. It causes the toothbrush to vibrate against the teeth and the gum-line, resulting in the removal of plaque. It is estimated that this toothbrush is responsible for removing up to 7 times more plaque than traditional toothbrushes. Another one of the actions is the fluid dynamic action. Here, the water is moved within the spaces of the teeth, removing food pieces and germs from here as well. One of the main benefits of this is the fact that your gums end up healthier due to this cleaning action. Therefore, you really do get a proper and thorough cleaning. With the White mode, all of these actions are largely the same. However, here, there is a little more focus on removing stains from the teeth. The specific movement of the brush head causes there to be a greater removal not just of plaque but also other build-up on the teeth. This will help with anything from coffee stains to discoloration caused by tobacco. According to the Philips Company, you can have your teeth looking two shades lighter in just two weeks’ time. Although there are just two modes, these can be further customized as there are three intensities that you can choose from. These are low, medium, and high. You can first select your preferred mode and then choose which intensity that you would like it to operate at. There is no denying that Philips has a lot of faith in their product – after all, they have been doing this for a while. This is why this toothbrush comes with a two year limited warranty. However, since the brand is known for their excellent quality, you really will not be needing it. Time and time again, Philips electric toothbrushes stand out because of their incredibly battery life. The HealthyWhite+ boasts similar claims. This is because it utilizes a lithium ION battery. Once the toothbrush has been fully charged, it can be used for about three weeks at a time. This calculation is based on an individual using a toothbrush twice a day, each time only brushing for two minutes. Nonetheless, it is still an impressive lifespan. Not to mention, you will be hard pressed to beat this particular feature with any other electric toothbrush out there. You cannot complain about the Philips Sonicare HealthyWhite+. As with all Philips electric toothbrushes, this is an excellent cleaning agent. You will definitely get the clean teeth that you want and probably have whiter teeth as well. Looking back, there really aren’t too many negative points. The only real shortcoming with this toothbrush is its lack of modes. That being said, it will work fine for most people with only minimal cleaning requirements. Individuals who require a little something more dedicated will have to look elsewhere. Still, if you want bright, gleaming pearly whites, then this is the brush for you.